Skills and Abilities: Hunter and leader with over 10,000 years experience. Powers: Her physiology is at the peak of human abilities for sight, smell, healing, agility etc. Insect like wings allow flight and she can harness magic to produce light and concussive force from her hands. She can also channel her powers through her spear with devastating effects. She was one of the founders of the Faye kingdom/Rahtumi revered as the “Saoteria” or “savior” though she left to wonder the earth in anticipation of the Samusara’s return [SoulFire v3 #6]. 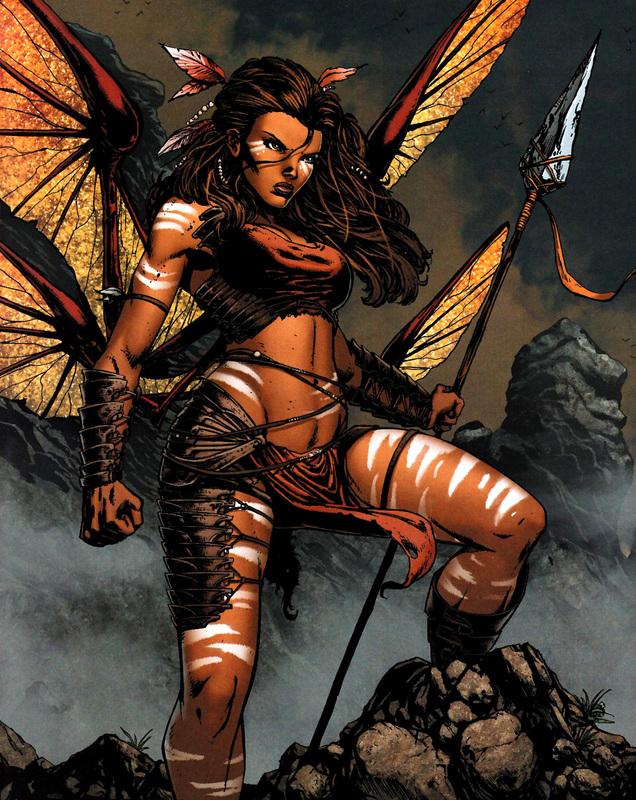 When the living embodiment of the Samusara’s darkness manifested she fought it off in Africa with her warriors [Soulfire v3 #0]. Journeying to America to seek out the new Samusara (Malikai); she and her warriors ambushed and almost killed him before he escaped [Soulfire v3 #3-4]. Returning to the Faye city she had helped found centuries before she demanded the location of the Samusara so she could kill him. Opposed by Grace they had to make an uneasy alliance to fend of Onyx and later the manifestation of the Samusara’s darkness itself. In the end she realized that the latest Samusara, Malikai was not like the evil Kaaz when he sacrificed his life to destroy the manifestation of evil and killed himself in the process [Soulfire v3 #6-8].